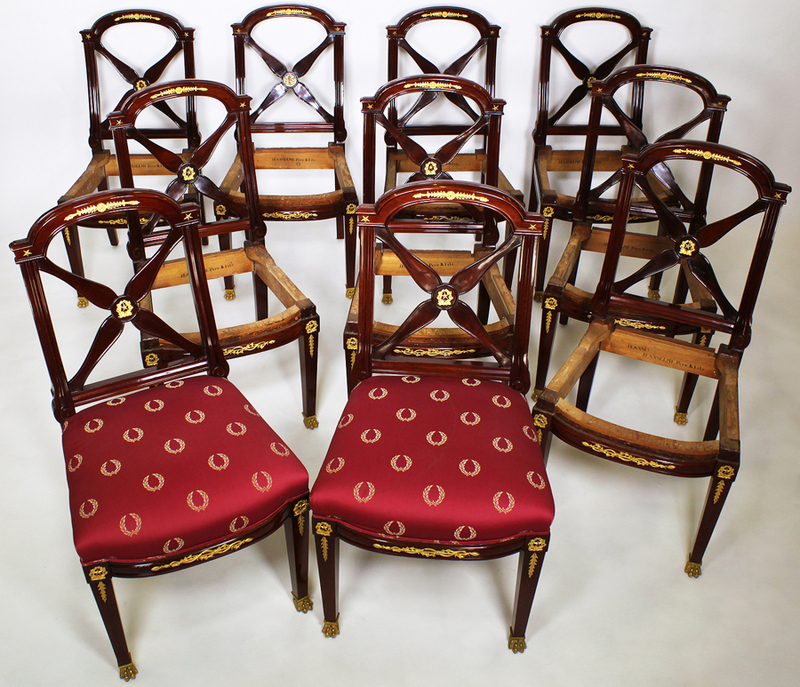 A Fine Set of Ten 19th Century French Empire Napoleon III Mahogany and Gilt-Bronze Mounted Dining Chairs by Jeanselme Pere & Fils. The slender mahogany frames with an arched cross-banded back, surmounted with gilt-bronze mounts allegorical to the Empire design with laurel wreaths, acanthus, stars, acorn poles and raised on lion paw sabots. Circa: 1865-1870. 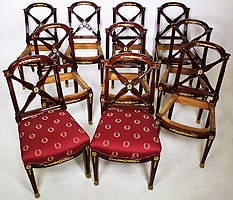 Note: Only two chairs have been upholstered in a burgundy fabric with gold wreaths for display in our showroom.The rest are just the frames. 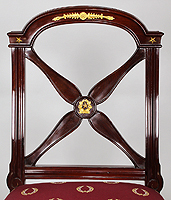 The Jeanselme's were a family of French cabinet makers. In 1847 Alphonse-George Jacob family sold the Jacob-Desmalter workshop Joseph-Pierre-François Jeanselme (1824-1860), who, together with his son Charles-Joseph-Marie Jeanselme (1827-1871), supplied fine furniture to the French and imperial courts. 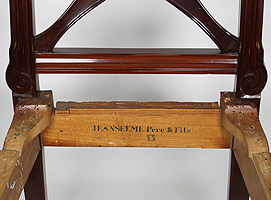 Their furniture is stamped ‘Jeanselme Père et Fils’. 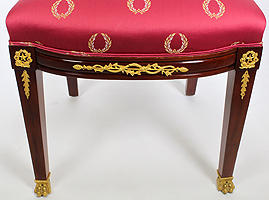 From 1863 to 1871 the business was run by Charles-Joseph Marie in partnership with the ébéniste Auguste Godin, and the furniture was stamped Jeanselme Fils Godin et Cie. In 1893 the company took over the Lemarchand workshop.